When Dylan Smoskowitz joined the Mississauga Steelheads this season, he wasn't sure what to expect. Not long into his first game, he was sure he was in the right place. "Took me about four shifts until I got my first goal," Smoskowitz told NHL.com, and he hasn't stopped scoring since, with a team-high 30 goals, which ranks him 19th in the Ontario Hockey League and sixth among 2013 NHL Draft-eligible players in the league. Dylan Smoskowitz doesn't know what his NHL future holds, but his plans for the early part of the summer are booked. 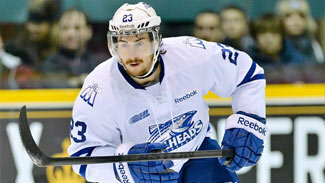 The Mississauga Steelheads center will play for Canada at the 2013 Maccabiah Games, which will be held throughout Israel July 18-30. The hockey tournament, which also features France, the United States and Israel, will be held at the Canada Center ice rink located in the northern town of Metula. "That is going to be an out-of-this-world experience," Smoskowitz told NHL.com. "It's a chance to represent my country. It might not be the World Juniors or the Olympic games, but you are wearing that Canada logo on the front of your jersey. I'm going to go out here every game and try and represent my country the best I can." Among those joining Smoskowitz on the team is Michael Henrich, a 1998 Edmonton Oilers first-round draft pick who has played throughout Europe since 2004. Like Smoskowitz, Henrich is a former Barrie Colts player. But Smoskowitz is most excited about the coach he'll be playing for -- Stanley Cup champion Mike Keenan. "Playing on a team coached by NHL superhero like Mike Keenan is something I've been looking forward to since I heard he was going to be coaching the team," Smoskowitz said. "It's kind of a surreal feeling knowing that guy is going to be calling my name, sending me out on the ice. Just the knowledge I can get from that guy is endless. I'm going to be like a sponge and try to soak it all in." Besides leading his team in goals, the 5-foot-10.75, 169-pound center is second on the team with 51 points, and also has team-high totals of 12 power-play goals and a plus-6 rating. Not bad for a player who was watching the first few games of the season from his parents' house in Richmond Hill, Ont. Smoskowitz, a 2009 OHL draft pick of the Barrie Colts, had 21 goals in 2010-11, his first season in the league, but slumped badly last season with just three goals and nine points in 60 games. When things still weren't working when he arrived at Barrie's training camp, the team sent him home. "Coming into the season I had such high hopes," Smoskowitz said. "I had worked really hard in the summertime. I thought I had improved some of the aspects my game really needed improving on, and I worked on my strengths to keep them fresh. "But as soon as I got to Barrie I felt I wasn't given a fair shake and I was placed in a role where I couldn't succeed and couldn't really show everyone what I worked on and how much I improved. And basically they stopped believing in me and sent me home, whether that was to wait for a trade or just they really had no use for me in the lineup." Smoskowitz finally got what he wanted Oct. 4, when the Colts traded him to the Steelheads. Mississauga coach/GM James Boyd was looking for a player who could score, and it helped that he had a bit of prior knowledge of Smoskowitz, who had 29 goals in 55 games with the Mississauga Chargers of the Greater Toronto Hockey League in 2009-10. "He played locally here for one of our affiliate teams," Boyd told NHL.com. "We had a young player who was on the same team [and] we watched him a little bit during that year. He put up a number of points that year, and then he scored 21 goals in his first year [in the OHL]. Last year he had an off year … and he became available for a trade at the start of the year. We were familiar with him and some of the success we had." Boyd placed Smoskowitz at center on a line with last season's leading scorer, left wing Riley Brace, and right wing Josh Burnside. The trio meshed immediately, and has carried the Mississauga offense with 55 of the team's 136 goals. "I'm more of an outside guy, find my open ice out there and look for open spots," Smoskowitz said. "[Brace] is just a grinder and a workhorse and the same goes for Josh. Those two guys go into corners, one of them is going to come out with the puck nine times out of 10. If I can get open and find those spots, make myself available for passes, I'm pretty confident in my abilities to put the puck in the net." He has done just that multiple times this season, but calling himself an "outside guy" is a bit of a misnomer. Boyd said what stands out for him about Smoskowitz's game is his fearlessness in getting to the net. "If I made a highlight video of the goals he's scored, the bulk are five feet in front of the goaltender," Boyd said. "A lot of tips and screens and rebounds off of shots. He's willing to do that, willing to get his nose dirty to put the puck in the net." That element also has stood out to NHL Central Scouting's Chris Edwards, who said: "Dylan has a knack for scoring goals. He is in the right place at the right time, handles the puck well and has a very good shot. His skating is decent, but it is an area he needs to improve on. He works very hard and plays a steady two-way game." Smoskowitz, who was eligible for the 2012 NHL Draft but was not selected, is thankful just to have the opportunity to showcase himself for NHL scouts and potentially hear his name called this June. "I've always believed in myself and had that self-confidence that I am this kind of player and this is what I can bring to the team," he said. "I just never thought I'd get the amount of ice time and amount of opportunity I'm getting in the OHL at such a high level. I always knew if I ever got that chance I wouldn't let it slip by and [I'd] make the most of it."